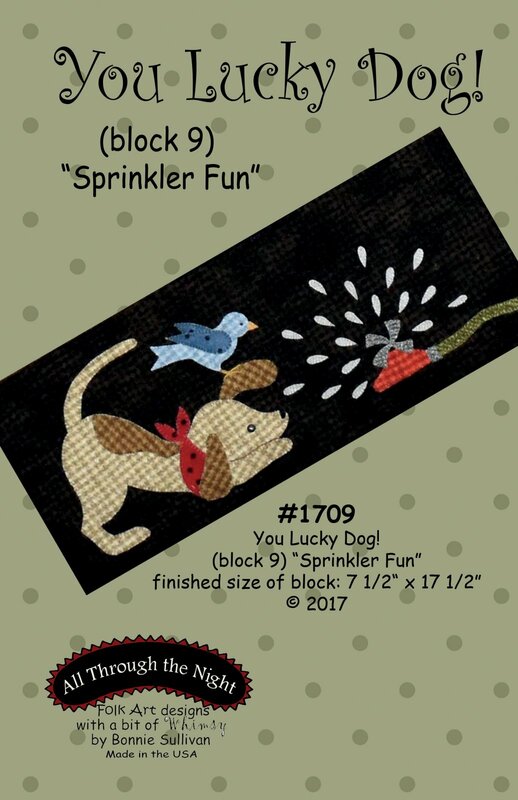 All Patterns > Block of the Month > 1709 You Lucky Dog "Sprinkler Fun"
1709 You Lucky Dog "Sprinkler Fun"
Part 9 of an 11 part Block of the Month. The 11 patterns combine to make a 43 1/2" x 48" wall hanging featuring Lucky's antics with his little blue bird friend, Lucy. The directions for finishing the wall hanging can be found in part 11. 1701 You Lucky Dog "Run Lucky Run!" 1702 You Lucky Dog "Rollin' in the Clover"
1703 You Lucky Dog "Snack Time"
1704 You Lucky Dog "Time to Play"
1705 You Lucky Dog "Sharing"
1706 You Lucky Dog "Nap Time"
1707 You Lucky Dog "Garden Time"
1708 You Lucky Dog "A Little Birdie Told Me"
1710 You Lucky Dog "Best Friends"
1711 You Lucky Dog "Midnight Howl"